Adventures in 3D: How can I create a 3d game without spending a penny? How to create a 3d game without spending a penny? Loads of my students spend hours each night playing 3d computer games. I’ll be honest, if I wasn’t a teacher or a dad, I’d probably be doing the same thing. My brightest students often ask: “How can I make a game like Fifa / Call of Duty / GTA?” and I’ve always wanted to be able to give them a better answer than the usual “it takes a lot of time, money, effort and skill”. 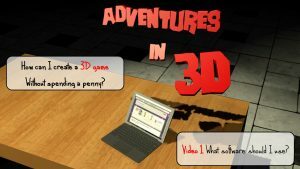 So this series of videos and blog posts is dedicated to students who are willing to invest the time and effort into learning the 5 skills I reckon you need in order to create a your own 3d games that you can be proud of. I’m aiming these videos primarily at iMedia and Computing GCSE students at Fulford School in York who want a fun project to apply the skills they’re learning in class to do something fun outside of lessons but I’m deliberately only going to use software that you can download and use legally for free. I’ll try to keep the videos between 3-5 minutes long so that you can dip in and out of the stuff that interests you. I’m not going to attempt to go much beyond the basics – just enough to give you an idea of what’s possible, to get you started and to let you loose amongst all the other great tutorials available online. Getting started is often the most intimidating stage but once you learn the basics the only limit is your imagination and the amount of time you’re willing to invest. The first video talks you through 5 tools that I’m recommending you download. All are free and all focus on a different skill. Ideally, you’ll have 5 people in your team, each one with a different piece of software, each one with a different role, but by all means try out as many of these as you want.